Albuquerque, New Mexico, and the surrounding area are home to a wide variety of spiders, including venomous and non-venomous species. Black widow spiders are the most dangerous spiders in the area, but violin spiders and other species can also deliver a very painful bite. Most dangerous spiders have easy to identify characteristics that make them easy to tell apart from harmless spiders. Black widow spiders are found in Albuquerque and are considered to be very dangerous to humans. The bites of black widow spiders have caused deaths, particularly in the young and old. The bite is painful right away and the poison will instantly start to attack the nervous system. Headache, vomiting, stomach pain and hypertension are common symptoms associated with a black widow bite. Black widows can be identified by their black color and body that is normally 1/2 inch long. Females normally have an hourglass marking on the bottom of the abdomen, which can vary in color but is normally red or yellow. They are common outdoors in brush piles, trash piles, under stones, in sheds and many other places. Indoors, they are commonly found in crawlspaces and basements. Violin spiders are also known as recluse spiders, and are named for their violin-shaped body. Common New Mexico recluse spiders include the Arizona recluse, Apache recluse, desert recluse and sometimes the brown recluse. The brown recluse spider is the most dangerous violin spider in the Albuquerque area. 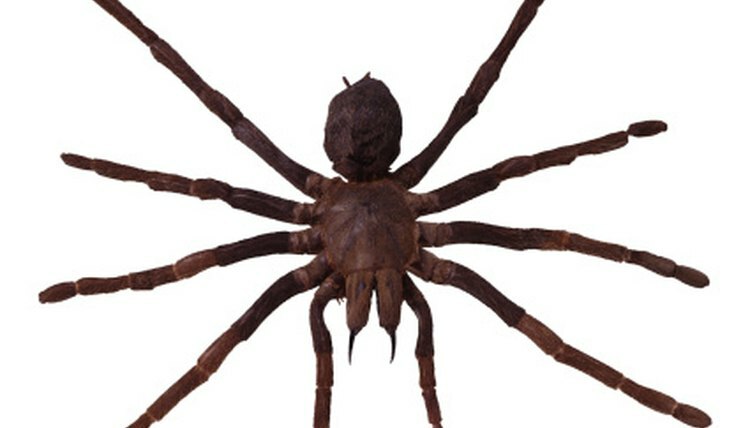 Brown recluse spiders have a body length of 1/4 to 3/4 inches and an abdomen that is violin shaped, with the neck of the violin pointing towards the back of the body. Another distinct characteristic is all recluse spiders have six eyes that are in pairs of two instead of eight eyes. The bite of a brown recluse can cause significant skin injuries including tissue loss and the death of skin cells. Medical attention is needed for people bitten by brown recluse spiders. Other recluse spider bites can still cause damage, but are less serve than brown recluse bites. Orb weavers are a common outdoor spider found in Albuquerque and are considered harmless to humans. They are commonly found on lawns or in gardens, and make very big webs, some stretching as long as 6 feet across. Orb weavers have a big, round abdomen, and normally reach body lengths of 2/3 to 1 inch in length. Different species will have different-colored abdomens, and there is a wide variety of orb weavers in New Mexico. One of the common types of orb weavers in Albuquerque is the golden orb weaver spider. Wolf spiders are commonly found outdoors around Albuquerque. They hunt insects and do not build webs. They are easy to spot because they have a very hairy body and are 1/2 to 1 inch in body length. They are normally gray or brown in color. Wolf spiders have a bite that is painful and normally causes swelling and discomfort for a week or two. However, the bites are non-lethal and wolf spiders are not considered a serious threat to humans.